Green and Pretty: Build a Barrel rain reservation systems can be built in any shape to meet owners’ needs. The barrels are a product of Rain Reserve in Mansfield, which is helping home owners reuse rain water. Rain. When your convertible is parked outside with the top down, it’s a real headache. When the heat has been relentless, it’s a welcome relief. A local company is offering another way to look at rain—as a valuable home resource. Rain Reserve (802 N. Hwy. 5, Mansfield, 417-429-1356, rainreserve.com) is the invention of Enginuity, LLC, an environmentally conscious manufacturing company located in Mansfield. In 2007, Rain Reserve partnered with a Madison, Wisconsin, community program to build a rain collection system. The benefits, for both people and the environment, were obvious. Galal says Americans use an average of 50 gallons of water a day. “Once someone starts saving 50 gallons of water, they’ll learn the value of that water and how much they’ll save,” he says. Fortunately, saving water doesn’t have to cost a ton of money. Galal says a person can start reserving water for $100. “If you’re trying to go green, or if you want to get off the grid, it’s a great way to start, because it’s not a big investment, but you get a lot of value out of it,” Galal says. Down the Spout: Rain Reserve's diverter kits attach to a home's downspout. While the rain water flows to a storage container, leaves and debris flow out of the spout. 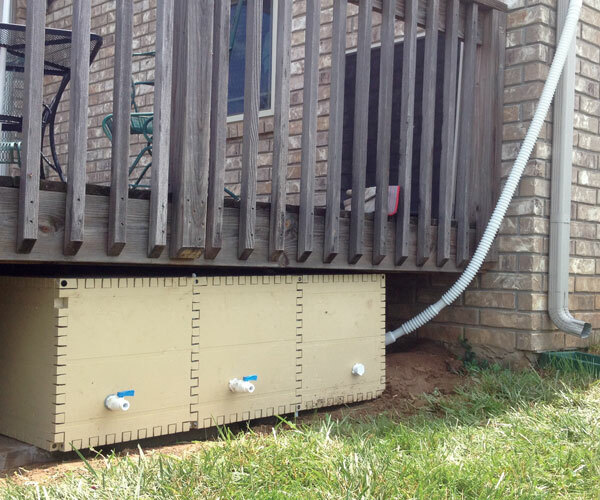 Rain Reserve uses a diverter kit attached to a home’s downspout. As water comes down, hydrostatic tension keeps fluid on the walls and debris in the center. Water is diverted into a hose that flows to a storage container, and leaves and other debris flow out of the spout. In addition to the diverters, Rain Reserve has a new rainwater storage option called Build a Barrel. Galal says the idea came from watching his 5-year-old son, Sharif, play with Legos. The containers, like Legos, can be built into any shape. 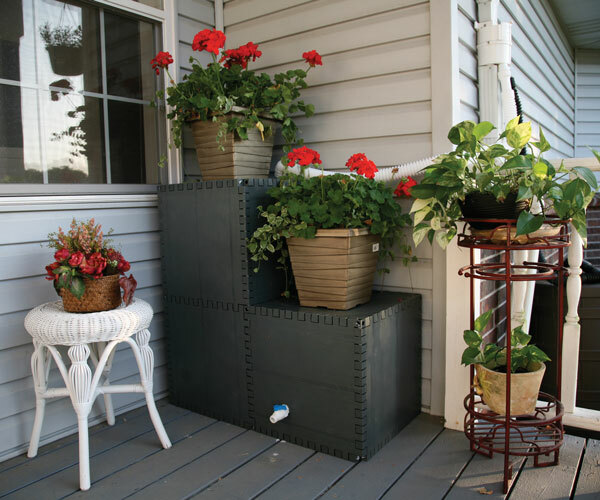 This offers a variety of location options, whether under a deck, below bushes or even configured as a bench. Some people even grow plants on top of their Build a Barrel. Inside the containers, water is sealed, making it mosquito-proof. Build a Barrel systems start at 50 gallons and can be as large as 10,000 gallons. People can start small and add on according to their needs and budget. To learn more or to purchase a rain reserve kit, visit the store in Mansfield or go to rainreserve.com. Custom installations are also available for $3 to $6 per gallon. Currently, Rain Reserve products are sold online at rainreserve.com, Amazon.com and Hayneedle.com as well as in Ace Hardware, Tru Value, Menards and other locations. Greene County residents are eligible for a City Utilities instant rebate of $25 per 50 gallons if purchased through the James River Basin Partnership (jamesriverbasin.com).